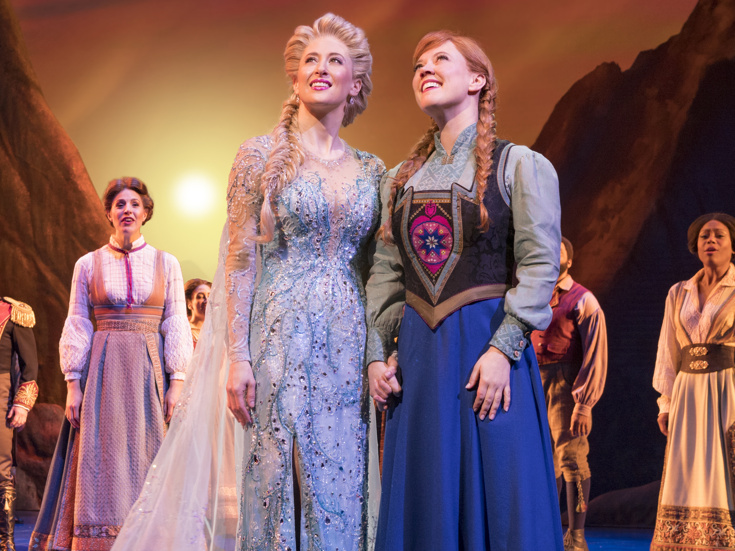 Caissie Levy & Patti Murin with the cast of "Frozen"
In celebration of International Women's Day, Disney on Broadway has announced the 2nd annual Women's Day on Broadway: Inspiring Changemakers. The event will be held on March 12 at the St. James Theatre, home of Frozen. This year's event will focus on changemakers driving progress within the theater and entertainment industry, highlighting ways each person can become an agent of change. The event will feature panel conversations and a variety of speakers and presentations. Following its launch in 2018, Women's Day on Broadway aims to engage attendees of all genders and backgrounds in a day of open and honest dialogue about gender equality in the theater industry and beyond, immersing participants and audience members in a series of conversations, empowering each attendee to drive change and make an impact. Disney on Broadway invites professionals of all genders and backgrounds interested in the topic to attend the event free of charge. For more information and to reserve a free general admission seat, click here. Additional specifics for the event will be announced at a later date.